The uproar surrounding the FIA’s decision to punish Lewis Hamilton following the controversial end to this year’s Belgian Grand Prix has been further compounded after having published details of the ruling. "You have to remember this is a very complicated, technical sport," said Max Billingsworth of the FIA. "The average laymen may find the underlying principles that we are trying to uphold difficult to follow. The main one being to make sure that red cars get all the trophies." The FIA said that it was also investigating reports that a visiting car club had their regular Sunday afternoon parade ruined by the thoughtlessness of other people on the roads of Spa. "The Ferrari Driver’s Club was very disappointed to find other cars on their regular parade route. Not only that but these cars appeared to be racing and repeatedly overtook them at alarming speeds," explained the FIA representative and keen whip enthusiast. The FIA said that a silver car was seen by hundreds of millions of people speeding in the Wallonia area of Belgium and that in addition, despite the presence of rain that the driver was clearly not driving to the road conditions. "The speed limit on the roads through the Ardennes is 60Km/h, however a silver car driven by a black youth was repeatedly clocked at over 300km/h, " said Mr Billingsworth. "We also have reason to believe that his car was not fitted with windscreen wipers in the obviously inclement conditions, nor was it fitted with a badge in the shape of a prancing horse which could lead to automatic disqualification." The main miscreants are believed to be a notorious gang of racers who had travelled from from Woking in England. One Ferrari club member, who did not wish to be named but said he had travelled from Finland for the parade, told of his trauma at the hands of the gang. "It was very embarrassing. Someone should do something," he said reaching for his second bottle of Vodka. "I was so startled to be mugged at the bus stop that I simply drove into a wall. Again." Hope you don't get paid for this. Brilliant. 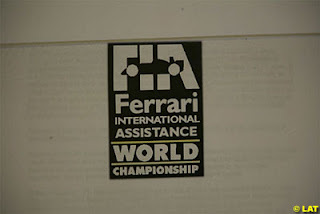 Mosely should read this to see what the FIA has become.